Bird scooters on the sidewalk in Downtown Santa Monica. Photos by SMN. After a woman riding an electric scooter was injured in a crash earlier this week, the city of Santa Monica issued safety tips for using the increasingly popular mode of transportation. 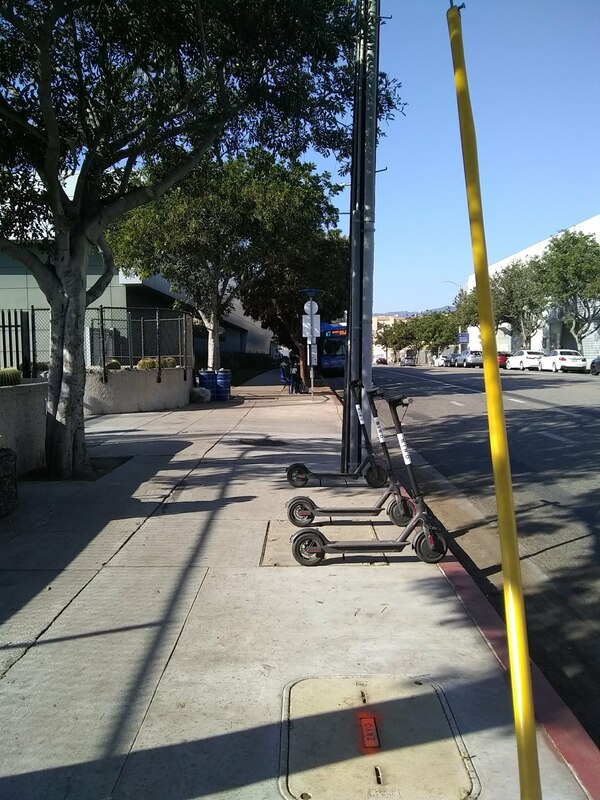 The woman, according to the Santa Monica Daily Press, was riding a Bird scooter, many of which have been seen throughout the streets of Santa Monica in recent weeks after the company launched its pay-by-the-minute rental service for electric scooters. You can only ride if you have a valid driver’s license or instruction permit. Wearing a helmet is required for all ages. You must ride by yourself, and not with any passengers. You may not park on the sidewalk in the way of pedestrian traffic. You must not ride at night unless the motorized scooter is equipped with proper lighting equipment, including a front light source which is visible from the front and sides, and reflectors.